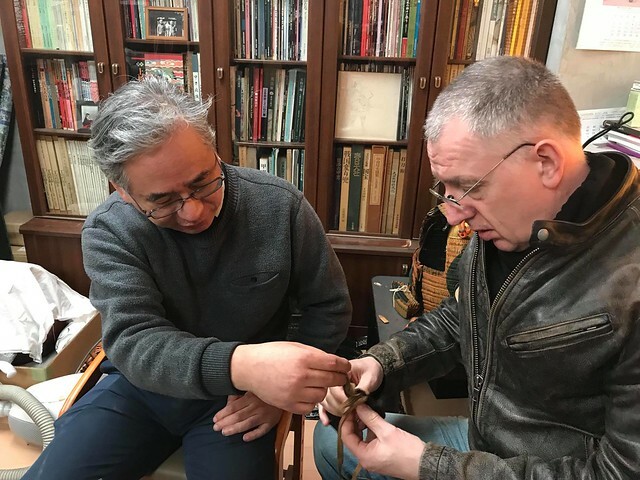 My training in armour restoration began with learning the art of urushi under Miss Miho Kitagawa, a professional urushi teacher of the Kyoto Prefectural University. Urushi is natural Japanese lacquer and is found on most armours.Understanding urushi-nuri is paramount to armour making. Over the years I was able to apply my lacquer skills to armour. I’ve been repairing and making armours since the 1980’s and have never had an issue with anyone. However, I found myself being criticised by a small society of European collectors and some another craftsman that entered the restoration market. Their critic of my standard was based on their personal opinion and that I had never trained under a katchushi based in Japan. To date, my clients have always been completely satisfied with my work, but other than that I had little defence against the “he never trained in Japan” argument. So I took it upon myself to change this. I asked a number of people that were connected with the leading katchushi in Japan if it was possible to gain an audience. I wanted to the real katchushi masters to critique my work as logically they have the only opinion that is valid. In early November 2017, I travelled to Japan for a two week period. I met with five leading katchushi with samples of my work. The result was the same with each one, my standard was high. In fact, in some areas of restoration, it was equal. This validation was the most rewarding compliment I have ever received. Each katchushi that I visited was aware of the same lacing technique error that I making, and in turn, each showed me how to correct this. I was able to visit each katchushi workshop, I have not provided any photos of these are they are considered private. The katchushi extended a professional courtesy to me that completely exceeded my expectations, they shared high-level secrets and insights to techniques on a scale that I was overwhelming. This has left me humbled and in debt to these wonderful people. One katchushi remarked that its okay to restore armour, but a true katchushi must be able to make armour too. Therefore he has invited me back to study on an ongoing basis where I will learn the traditional techniques of armour manufacture. My journey has improved tenfold, I have my validation and now the opportunity to progress even further with the confidence of knowing that I am currently the leading restorer outside of Japan. This entry was posted in Katchushi. Bookmark the permalink.